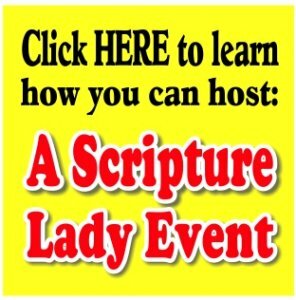 The Scripture Lady loves creating Bible verse games for kids! Here is one called “Missing the Mark” to help learn Romans 3:23. I really enjoy learning definitions to words. For example, I remember sitting in my youth group years ago and hearing our teacher say that sin, in its foundational definition, means to miss the mark. In other words, sin puts us off track from where God wants us to be. Our elementary kids need to understand this and realize that all “miss the mark” and sin at times. That’s what Romans 3:23 says. Here’s the complete version: “All have sinned and fall short of the glory of God.” Here is a fun Bible verse game you can play with your kids to help them memorize this important Scripture. 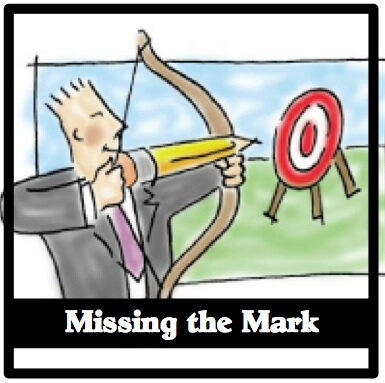 It’s called “Missing the Mark”. This game can actually be played indoors or out. If you are cooped up in your classroom all the time, you might want to grab a piece of sidewalk chalk and head outside. Otherwise you will need to make the following grid, I will describe, on your floor with some masking tape. Make a 12-square grid, but then put a 13th square right in the middle. I suggest making the grid about 1.5 yards long and wide. Next, label each square, except for the middle one, with one word from Romans 3:23 along with a point value of 200, 300, or 400. The middle square gets a point value of 500. There are 12 words in Romans 3:23 including the reference. Do not place them in any kind of order. They should look scrambled on the grid. Finally, grab a beanbag or some other object that will throw and land nicely on the grid. You are now ready to play the game. Before beginning the game, say the following: Have any of you ever shot an arrow? (Wait for responses. If no one has shot an arrow, ask if they’ve ever seen someone shoot an arrow.) I’ve shot an arrow and I hardly ever made the bulls eye. I always missed the mark. Did you know that’s kind of what sin is like? It’s like missing the mark or falling short of where you should be – where God wants you to be. Romans 3:23 says this: “All have sinned and fall short of the glory of God.” This verse means that we are all sinners and we all miss the mark at times and do wrong things that displease God. Let’s play a game called “Missing the Mark” to help us memorize this important Bible verse. Divide your class into 2 teams for this Bible school activity. Give a child from the first team the chance to throw the beanbag. He should try for the middle square. If he succeeds, he must look away from the grid and recite Romans 3:23 by heart. If he does so correctly, he earns 500 points for his team. If he lands on a square with a word on it, he can earn the points on that square by saying the verse while looking at the grid. However, before he says it, you the teacher, must erase the word in the box. Play continues to the next team. Eventually, it will get harder to recite the verse as the words are erased. On any turn, if the beanbag lands on a square whose word has already been erased, then the teacher erases a different word on the grid, but the child only earns the points of the original square. The team with the most points wins. Thanks for the six free bible review games.